Dominican Republic celebrates Independence Day. In 1844 the Haitians gave up control after dominating the country for 22 years. According to the CIA World Factbook, the Dominican Republic is about twice the size of New Hampshire. Located in the Caribbean Sea, both the Dominican Republic and Haiti occupy the island of Hispaniola. Over 10 million people live in the Dominican Republic, and Santo Domingo is the capital. The country exports sugar, tobacco, and coffee. The country also encourages tourism. 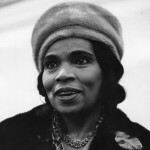 Marian Anderson (born Philadelphia, Pennsylvania, 1897; died Portland, Oregon, April 8, 1993) was a singer and diplomat. She was the first African American soloist at the Metropolitan Opera. In 1939 the Daughters of the American Revolution would not allow her to perform in Constitution Hall in Washington, DC. Eleanor Roosevelt and others were outraged. Days later she sang before 75,000 people in front of the Lincoln Memorial. Her courage and talent brought her great fame. She was a United States delegate to the United Nations in 1958. She received the United Nations Peace Prize in 1977. Children could read the wonderful book, When Marian Sang, written by Pam Munoz Ryan and illustrated by Brian Selznick. Children could also learn more at Marian Anderson. Florence Parry Heide (born Pittsburgh, Pennsylvania, 1919; died Kenosha, Wisconsin, October 23, 2011) wrote more than 100 books for children. Her books included The Treehorn series, illustrated by Edward Gorey, and Some Things Are Scary, illustrated by Jules Feiffer. Henry Wadsworth Longfellow (born Portland, Maine, 1807; died Cambridge, Massachusetts, March 24, 1882) was a poet and writer. His works include The Song of Hiawatha and The Wreck of the Hesperus. Children can read his works at: Project Gutenberg. Children can learn more at: Henry Wadsworth Longfellow. Uri Shulevitz (born Warsaw, Poland, 1935) is an American writer and illustrator. He has written and/or illustrated at least 38 books. He received the 1969 Caldecott Medal for The Fool of the World and the Flying Ship. He has also received three Caldecott Honor Awards: The Treasure in 1979, Snow in 1999, and How I Learned Geography in 2009. Children can learn more about him at: Uri Shulevitz. John Steinbeck (born Salina, California, 1902; died New York, New York, December 20, 1968) was an author. His works include Of Mice and Men and The Grapes of Wrath. He was the Nobel Prize Winner in literature in 1962.